' ' Cinema Romantico: Woot Woot! 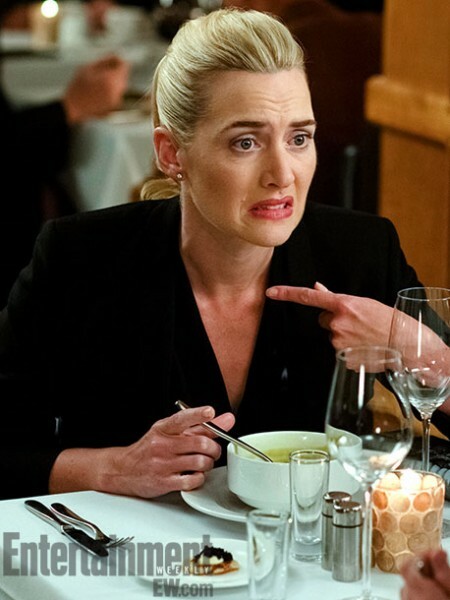 First Image Of Kate Winslet In Movie 43! Woot Woot! First Image Of Kate Winslet In Movie 43! At last! The eternally delayed "Movie 43" (now set for a release next year) that has been the apple of my eye since I first realized Kate Winslet was not only FINALLY getting to do a comedy - with The Farrelly Brothers writing and directing - but that she was playing a character who shared the name of her character in "Heavenly Creatures." Peter Farrelly just recently gave an exclusive interview to Entertainment Weekly regarding the project and granted them access to several exclusive images. Of the Winslet storyline all we know is this: "Winslet goes on a blind date with Hugh Jackman and learns he has a weird birth defect. Freak-outs ensue." Farrelly says: "I spoke at Harvard last year with my brother Bobby. People always ask if we’re going to do a dramatic movie, so we said we just did, with Kate Winslet, and told them, ‘Let’s show a little clip.' People were so stunned. I don’t think an audience at Harvard has ever laughed that hard. There’s the fact that Kate Winslet had the balls to just go for it." Well, of course Kate Winslet had the balls to just go with it. She's KATE WINSLET. Savvy? The question, though, still remains - why is her character named Juliet Hulme? And does this mean Jackman is playing Wolverine? And if so, are the claws his birth defect? And if so, is Juliet Hulme anti-mutant? Vance: I can't say I saw The Three Stooges. I was never a fan of the original Stooges so I had no desire to see the movie. But the Farrellys are a lot like a roller coaster. Highs, lows. Candice: And that's all that needs to be said. Right, it's almost superfluous to even officially say you didn't care for Three Stooges, only I did read a couple places that it was surprisingly strong. I really dug Hall Pass, so I was ready for another underrated Farrelly effort. But this post was about Kate Winslet, and I inadvertently hijacked that. Yes, I like Kate Winslet. Have you seen Eternal Sunshine of the Spotless Mind? That's one thing the memory erasing procedure didn't address - Joel would have forgotten ALL the movies he saw with Clementine and vice versa! Yikes! That does look really funny -- it appears to be an anthology, directed by numerous people. Which explains the mind-boggling number of recognizable faces. Oh. Wow. Yeah. I need to see this. That's a definite.